This is my first time posting on this forum. I have tried to format this question properly, but let me know if I need to correct anything. I searched to see if someone else had a similar problem, but let me know if someone has already answered this question. Overview: I am sending pulses to my Arduino, but sometimes one single pulse is interpreted as anywhere from 2 to 30 pulses. 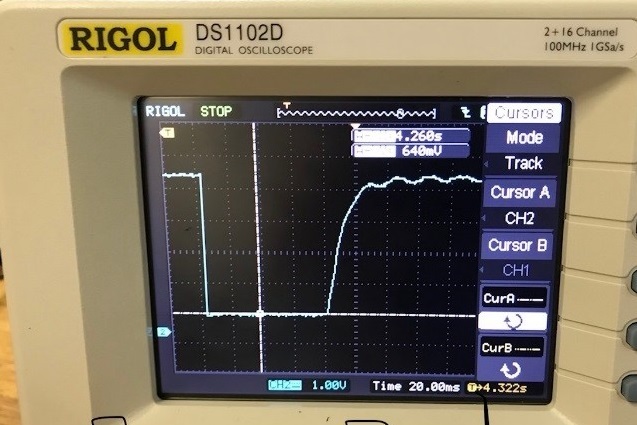 But after looking at the pulse on an oscilloscope (see Fig. 1) I am not sure why. When I use a really long wire the ratio of false pulses to legit pulses is about 1 to 1. I shortened the length of the wire and improved the situation, so that only 1 in about every 2,000 pulses is registered as a false pulse. For one test, I added a capacitor to the short wire situation, but that increased the rise time and made the problem worse. I am currently using attachinterrupt and have tested the situation with using both a rising and falling edge. Right now, I mainly want to understand how interrupts work on the Arduino in light of my current problem, although I welcome general advice. When I set the interrupt to the falling edge, why does the Arduino still sometimes count 1 pulse as several? The falling edge in the photo, which is for the really long wire case, lasts about 40 microseconds and appears to have a clean break. The pulse remains low for about 80 milliseconds. Could the falling interrupt trigger during the rise time based off the oscillatory behavior shown in Fig. 1? I smoothed out the signal by adding in a 1 nF capacitor, but the Arduino still counted false pulses. So could the rise time period have anything to do with it? I also have a 10k Ohm pullup resistor connected to the Arduino's 5 V for the pulse path. I have the relevant code attached below. I have much more code as well, but it deals with saving pulseCounts to the SD Card and uploading electricity consumption files through the cell network. Firstly, unless the processor pin is a Schmitt trigger, increasing capacitance will only make the problem worse by allowing any noise to be interpreted as multiple high-low transitions. For a CMOS logic input the area around the transition point of 1/2 VDD typical is actually an area of linear operation, not digital. 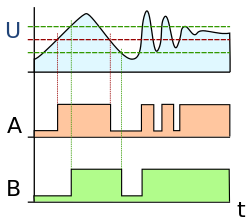 The red line represents the typical CMOS threshold and the green lines represent the thresholds defined by the hysteresis of the Schmitt trigger. The hysteresis defines the noise immunity of the input. Most processors have pins that are equipped with a Schmitt trigger or and external device like a 74HC14 can be used. Another way to deal with this type of noise is to lock out any transitions within the expected pulse-to-pulse transitions: Once triggered, no more transitions are allowed until the lock out time expires. Not the answer you're looking for? Browse other questions tagged interrupt hardware or ask your own question.